Little Shop of Horrors to celebrate Storyhouse’s 2nd Birthday! Storyhouse announced today that a new production of Howard Ashman and Alan Menken’s musical Little Shop of Horrors will run on the main stage from Friday 10 May – Sunday 2 June, to mark the multi award-winning arts centres second birthday. The perennial cult-favourite sci-fi musical has devoured the hearts of audiences around the world for more than 30 years, following the story of floral assistant Seymour who stumbles across a new breed of carnivorous plant that promises to grant him fame, fortune and all his desires – as long as the blood keeps flowing. 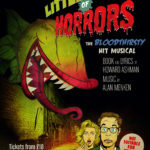 Following in the success of The Beggar’s Opera and A Little Night Music, Little Shop of Horrors will be the third consecutive Made by Storyhouse summer musical and will play on the theatre’s more intimate thrust stage. The production will mark Storyhouse’s second birthday, there will be celebrations throughout the building across the month of May.